Derry will meet Monagahan next Wednesday night in the Ulster Under-21 Championship quarter-final after goals from Niall Toner and Niall Loughlin sealed a deserved four point victory over Down in Celtic Park. Paul McIver’s young Oak Leafers were always the better side and built sizeable leads in both halves but twice allowed the Mourne men to come back at them in a match Derry should have wrapped up long before the final whistle. The home side raced into a 1-3 to no score lead after only four minutes with Conor Murphy’s sublime pass setting up Niall Toner for a superb sixth minute. Points from the excellent Terence O’Brien, Loughlin and Neil McNicholl already had Derry in charge then Murphy brilliantly picked out Toner who took the pass well before shaking off his marker and slipping a lovely low finish under Down keeper Marc Reed. Derry were winning the battles all over the pitch but Down stayed in touch thanks largely to the impressive Rory Mason whose free-taking was excellent throughout. Two quick points from Down full-forward Rory Mason reduced the deficit to four before Ballerin’s Jarlath Bradley received a black card for a 10th minute off the ball incident. He was replaced by Ryan McDonnell but Loughlin and Paddy McElroy restored Derry’s six point advantage before Down grabbed a lifeline through Pat Havern’s 18th minute goal. Mason was the architect, sending a long ball in toward goal that tempted Derry keeper Ben McKinless off his line. However Havern got there first to punch home a goal that left it 1-5 to 1-2 in the game Derry had dominated. With the sides swapping points for the remainder of the half, Derry’s 1-8 to 1-5 half-time lead was scant reward for some of the passages of play they had produced. The home side began the second half determined to make up for any lapses in the first and kept Down scoreless for the first 10 minutes as they stretched their lead to 1-10 thanks to two scores from Loughlin, one from a free. Down responded with two points of their own but any hopes of a comeback seemed to have been put to bed when the lively Loughlin got on the end of a long ball that had deceived everyone and fired a neat finish into the Down net for 2-10 to 1-07. The home side took their foot off the pedal after that and were almost made to pay for it deep into injury time when Down substitute Ronan McAlinden saw his fierce shot superbly saved at full stretch by McKinless. It was a save worthy of winning a match and rubber-stamped Derry’s passage into the last eight. 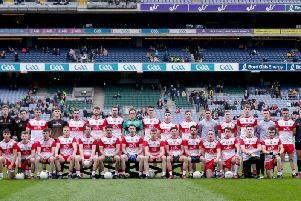 Derry: Ben McKinless; Anthony Hargan, Michael Sweeney, Declan Brown; Jarlath Bradley, Liam McGoldrick, Paddy McElroy (0-1); Neil McNicholl (0-1), Conor McAtamney; James Kearney (0-1), Terence O’Brien (0-3), Peter Cassidy; Niall Loughlin (1-4, 3f), Conor Murphy (0-1, Niall Toner (1-0). (Subs) Ryan McDonnell for J Bradley (black card), 10mins; Danny Tallon (0-1) for P Cassidy, 43mins; Jason Rocks for P McElroy, 58mins; Darryl Mullan for M Sweeney, 60mins.